Currently, all of the coating agents handled by our company, including the clear element of the main spindle product, are products with a high degree of completeness, but there are present conditions that elements required for coating are becoming more diverse. Also, as there are many coatings on the market, We felt the necessity of a coating agent that can approach users with a new approach. 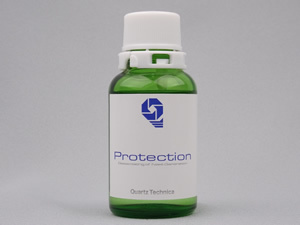 So, in order to respond to such a demand, our company's newly released coating, that is protection. Protection is a new type of coating specialized in "slip property" while taking over the advantages of glass coating. Changes that you can definitely realize after construction, such as outstanding water playing (water repellency), vivid gloss, slippery feel, etc. have appealing power, giving the user a high satisfaction.